The British Gazette » Brexit: Theresa’s Lament. Above Dido’s Lament sung by Evelyn Tubb. It was a truly inspired decision of the Austrian chancellor Sebastian Kurz, holder of the rotating EU Council presidency to hold the dinner, set the scene in the Felsenreitschule, a theatre familiar with many Britons who have watched The Sound of Music. The operatic associations – with the UK’s Brexit predicament – are curiously historic and profound. With those words she sealed the fate of the negotiations. A week ago on Thursday 13th September 2018 at 7.30pm there was a public meeting – Cornwall After Brexit – that was organised with the Penzance Chamber of Commerce by the former Liberal Democrat MP for St. Ives and the Isles of Scilly. The location was the Queen’s Hotel in Penzance. UKIP was represented by Ernie Warrender, UKIP Spokesman for Small Businesses. The audience was predominantly Lib-Dem supporters, which was not an indication of the support for the Lib Dems in Penzance but merely a characteristic of public meetings organised by a political party – most of the members of that party turn up at the meeting! There was however a cohort of Kippers who were there to support Ernie Warrender. After the speakers had made their speeches questions from the audience followed. These were accompanied by commentaries from the said audience. One of the organisers had naïvely hoped to restrict audience participation to asking questions but in such situations – people with strong opinions determined to voice them – commentaries from same are inevitable. What was interesting was that in a room full of Remaniacs, none of them picked up and ran with this! Which was the reason why I made the statement: to see how many would. The FACT is that Ireland is at the core of the Brexit issue and is something that means that UKIP’s objective cannot be achieved. UKIP originated as a single-issue Eurosceptic party established in London by the historian Alan Sked in 1991 when Alan Sked founded the Anti-Federalist League. The name referred to two things: the seeming inexorable trend of Euro-federalism (which the new campaigning organisation was against), but also the Anti-Corn Law League which was a successful political movement aimed at the abolition of the unpopular Corn Laws. Whilst this link seemed relevant to the academic historian Dr. Sked, it would pass completely by the vast majority of British voters. It was thus a truly inspired decision of Dr. Sked’s when he renamed the the Anti-Federalist League UKIP in 1993. You see, a party with the name, “United Kingdom Independence Party” clearly outlines it’s political objective and purpose! 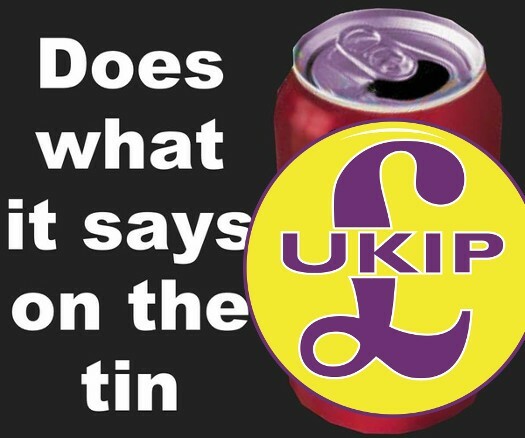 This “it does what it says on the tin” was something that attracted me to the party and why I joined in 1993 – although I did not renew my membership at that time. The 1997 United Kingdom general election was held on Thursday, 1st May 1997. UKIP, then led by Alan Sked, fielded 193 candidates and picked up 0.3% of the popular vote with 105,722 votes. However, as many UKIP members will remember there was the Referendum Party that had been founded by the late Sir James Goldsmith. With far more resources available to it, this party fielded 547 candidates and picked up 2.6% of the popular vote with 811,849 votes. The Referendum Party folded after this and many former members joined UKIP. The Referendum Party was another “it does what it says” party as it campaigned for a referendum on the UK’s membership of the EU. Now here is an irony. A cruel one at that: The 1997 election was the LAST general election where the objectives of both of these parties was capable of being achieved. In other words, had by some amazing miracle, ALL 193 UKIP candidates had been elected and let us say 193 Referendum Party candidates were elected, then a UKIP-Referendum party coalition government could have been formed. The first order of business would have been the organisation of a referendum on EU membership. Then, if won, the Brexit process would begin. This of course would have been BEFORE the fore runner of the Lisbon Treaty – the “European Constitution” was put forward and thus there would be no question of the constraints of the Article 50 clause. However, there was a more important impediment that was not in place. That was the Good Friday Agreement – which is an international treaty which became effective 2nd December 1999. Because the Good Friday Agreement binds the UK government on several points of law in Northern Ireland, it has de facto become a part of Constitution of the United Kingdom. What this means is this: That UKIP’s stated objective – to have the United Kingdom of Great Britain and Northern Ireland leave the European Union entirely cannot be achieved. What can – and should – be achieved is to have the United Kingdom of Great Britain and Northern Ireland leave the European Union, de jure, but for part of it – Northern Ireland – to remain, de facto, IN the European Union. This would be done by the United Kingdom of Great Britain and Northern Ireland leaving the European Union and rejoining EFTA whilst remaining in the EEA but with Northern Ireland remaining within the EU’s Customs Union by treaty agreement. This is unacceptable to the DUP. Apart form “regulatory divergence”, they would argue that such an arrangement causes Northern Ireland to be a 2nd class member of the United Kingdom because it will be bound by the dictates of Brussels and yet will have no representation in the European Parliament and that it’s MPs at Westminster will have no say in the Customs Union as the UK will have left the EU. The FACT is that whilst the Irish Republic remains a member of the EU, there is NO way round this! Given that Madame Mayhem is dependent upon the DUP for her majority, this for Madame is the mother of all Catch 22 scenarios! Given the theatrical backdrop, Salzburg and the Felsenreitschule, one cannot but recall to mind the aria, Dido’s Lament from Purcell’s masterpiece Dido and Aeneas. As British Gazette readers will know, the opera is based on Book IV of Virgil’s Aeneid which recounts the love of Dido, Queen of Carthage, for the Trojan hero Aeneas, and her despair when he abandons her. The libretto alludes to the Aeneid, the Roman legend of the Trojan warrior Aeneas, travelling to Italy from the betrayed and fallen Troy in order to settle there and secure his son Ascanius’s lineage. Their ship is blown off course from Sicily, and they land on the shore of North Africa, in Carthage, a town newly settled by refugees from Tyre. Aeneas falls in love with their queen, Dido, but dutifully departs for Italy leaving her. Distraught at his betrayal, she orders a pyre to be built and set ablaze so that Aeneas will see from his ship that she has killed herself. She sings the lament before stabbing herself as Aeneas sails away. We will leave it to the reader’s imagination to substitute the characters! We will however remind the reader that Purcell wrote the work during the period of turbulence of James II and the Glorious Revolution – the end of which of course was brought about at the Boyne in July 1690 – the link with Ireland yet again! As for the suicide of Dido, Queen of Cathage it must be remembered that to an audience at the end of the 17th Century this was truly shocking. This was because suicide was considered a heinous sin and was referred to as “self murder” and was in fact far, far worse in the religious and popular imagination than murder. This was because suicide was seen as the ultimate blasphemy and rejection of God. The sheer horror of such an act to the theological mind of a late 17th Century person cannot easily be appreciated by a secular irreligious early 21st Century person. At the same time, it seems extraordinary that a politician such as Theresa May should be prepared to commit political suicide not only for herself but for her party. There is of course another explanation: Madame is not planning on committing political suicide. Instead she will see to it that the calls by the People’s Vote become overwhelming and Parliament – against her wishes – legislates for a 2nd referendum and this is won by the Remain side and Brexit does not take place. British Gazette readers will recall that this organ has more than once referred to the Brexit process as; un grand coup de théâtre. We now await the next performance on Thursday 18th October, 2018!